The Design Partnership were engaged by Muswellbrook Shire Council to prepare a Masterplan for the existing sporting precinct known as Olympic Park. The Masterplan is a 30 year vision to ensure the park meets the needs of the future community. The Precinct includes rugby league fields and grandstand, tennis courts, regional swimming pool and a velodrome. The Masterplan incorporates passive sporting activities such as cycling and walking around its perimter. Inspired by Italy’s Cinque Terre, the 5 Lands Walk is a 9km coastal walkway that links five Central Coast suburbs. The new formal walking trail replaces existing informal and disconnected trails. The Design Partnership and ARTSCAPE prepared a concept Master Plan and strategy which reflected on the areas cultural history and unique characteristics.Following the adoption of the Master Plan, TDP and ARTSCAPE worked closely to design and document a new lookout that provides a commanding view of the coast line between Sydney and Newcastle, which is also set to receive temporary public artworks. 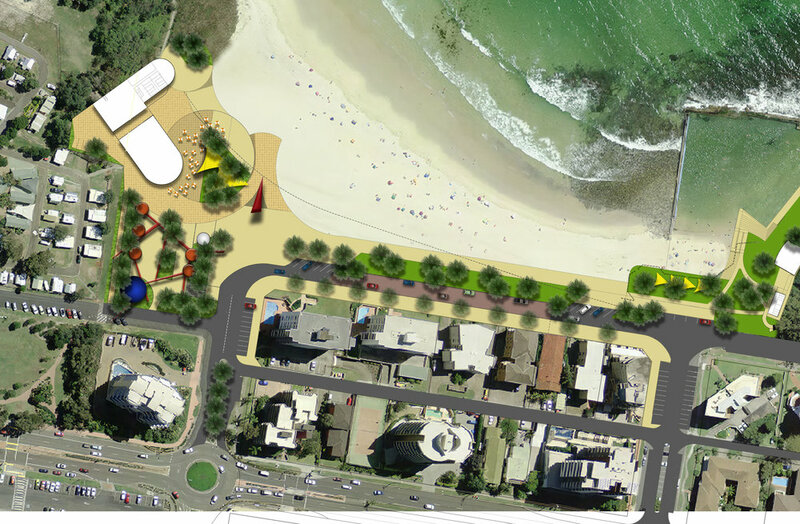 The Design Partnership are currently engaged by Mid Coast Council to prepare a Masterplan for the Main Beach Precinct. The Main Beach Precinct is located within the centre of Forster and includes the Forster Surf Life Saving Club and the historic Bullring Ocean Baths. The Masterplan seeks to revitalise the precinct with an upgrade of the Surf Life Saving Club, the Bullring and new public spaces.